I’m warning you. This post (and those to come) may change your perception of me. Are you ready for it? No, really. (Those of you that know me well are probably laughing). I struggle with anger. I am so full of emotion and love, but the flip side of that is this response. We sweep it under the rug as we smile at each other in the pick up line at school or sweetly say, “Please don’t do that again,” to our little one at the playground, for the third, fifth, tenth time. You know if I were anywhere else I’d be yelling, right? So I struggle with this. I’ve read some about it. A great book is She’s Gonna Blow by Julie Ann Barnhill. And just to be completely transparent, on one particularly teeth clenching, lip curling day my daughter has gone to the bookshelf in my room, pulled it out and asked if I’ve read it. Yes, she has. Why we hide it, I’m not really sure. But I don’t know too many women who are open about their anger. Pretending all is well may seem easier, but before long you’ll notice my clenched teeth or the way my shoulders creep up to my ears. Maybe you’ll see the tension in my forehead or the nails digging into my palms. I once read something about looking in the mirror when you’re reprimanding your kids or arguing with your spouse. I tried it. I did not like it. I don’t want to be the person that was staring back at me. So, this is where it starts. With me. I am angry with myself. A lot. I yelled too much today. Why can’t I just get it right? It happens every month…why can’t I control my emotions? These are just a few of the inner dialogs I have. Regularly. Maybe it stems from my fear of inadequacy. Maybe it is from childhood issues. Maybe it’s nature. Maybe it’s nurture. I don’t know what it is. I just know I don’t like it. Here’s the thing: I can’t fix it. But that’s ok. Because I can breathe through it. I liken it to the last time I was in labor. I had an amazing midwife who helped me do something I thought was impossible for me: deliver without any drugs. When I was in the thick of things she sat next to me and whispered three words: “relax your forehead.” She gently started in the middle of my forehead and ran her fingers to my temples relaxing my muscles in my forehead. As she did I exhaled. When I fought the pain, all I felt was tension. When I relaxed I could breathe. Sometimes it’s like that with anger. I need to stop fighting the situation and relax my body. Then I can exhale. 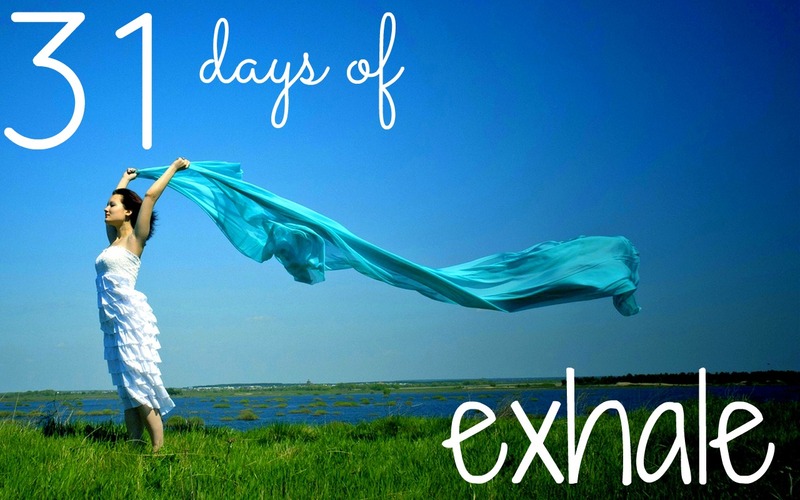 That exhale brings more freedom from my anger than any fist clenching ever has. So if you struggle with being angry at yourself, relax one small part of your body and exhale.